Reigning champions, team of Romania secured their place in the quarterfinal of the Cadet Girls Teams’ Event tomorrow at the STERILGARDA European Youth Championships in Riva del Garda. They beat Poland on their way to the best of 8. Adina DIACONU, Europe’s no. one player showed no mercy. She beat Agata ZAKRZEVSKA and with Andreea DRAGOMAN added another victory on her record in doubles. But it was not that easy for other favorites. Winner of the bronze medal last year in Ostrava, team of Serbia is out. After thrilling five matches Hungary prevailed. Big favorites cracked under pressure. 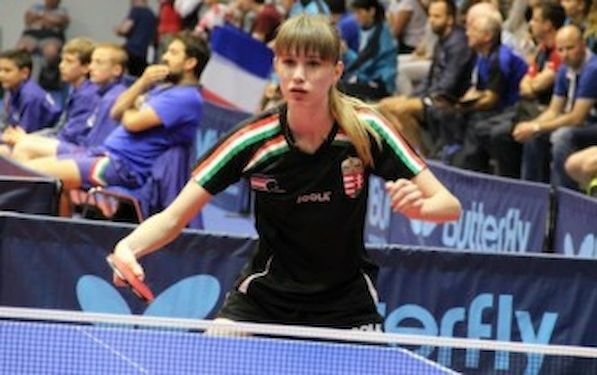 Leonie HARTBRICH won against both Izabela LUPULESKU and Sabina SURJAN whilst Orsolya FEHER added another point to the score sheet. Hungary will meet Turkey. Turkey’s Gul OZKAYA and Simay KULAKCEKEN succeeded in straight matches against Slovakia. Russia was also severely tested. Lisa LUNG was once again at the top of the game by beating Maria TAYLAKOVA and Anastasia KOLISH, but the rest of the team could not follow. Russia will play against France. French cadets beat Norway. Ukraine beat Sweden and they will meet Romania tomorrow, whilst Belarus will play against Germany. Jennie WOLF and Luisa SAGER overcame Czech Republic in straight matches.